Grooved & Cross Drilled Brake Discs. Benefit from better heat & water displacement. Designed to improve fade resistance & braking response. These discs are a direct replacement for the originals. Blind degassing holes reduce chance of stress cracks, common with through drilling. Full sweep wide scraper grooves help deglaze pads, reduce fade and promote parallel pad wear during use. Grooves extended to outer diameter allow exit of dust, grit etc. from the braking area (grooves that stop short only capture dust and grit and cause disc marking). Zinc plate and gold passivate finish improves cosmetic appearance beneath alloys and prevents corrosion on areas not swept by the pad. Premium British made product TUV approved, X-Ray inspected and balanced. This disc configuration used with EBC Kevlar pads will virtually eliminate brake fade by breaking down the surface gases produced by hot pads thus helping the pad remain in effective contact with the disc. This disc pad combination gives the ultimate braking performance from a standard system. Vented Disc Brake Conversion Kit. TR5/6 priced at £217.00: Consisting of 2x vented discs, 2x caliper spacers, 4x Kevlar pads, fitting hardware. This kit reuses existing calipers - spacers & all hardware supplied. 4 Pot Brake Conversion Kit. 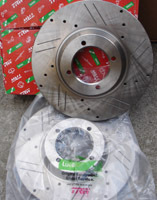 Consisting of 2x vented discs, 2x 4-pot calipers, fast-road pads (Mintex), fitting hardware etc. Everything you need in a box. £765.00 Calipers are sold on outright basis. Why not combine your uprated discs/calipers with a set a set of Kevlar Brakepads or Aeroquip Hoses?